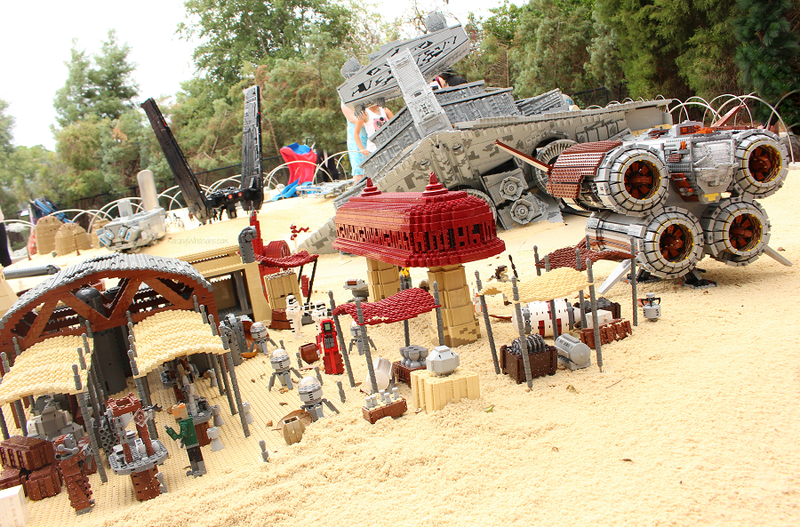 Want to see all of the LEGO Star Wars action up close? Be sure to check out our family video for a fun look at what’s in store for the 2018 LEGO Star Wars Days, including a walk through of the new MINILAND Star Wars display! Who loves visiting MINILAND USA as much as we do? You now have another reason to come back. 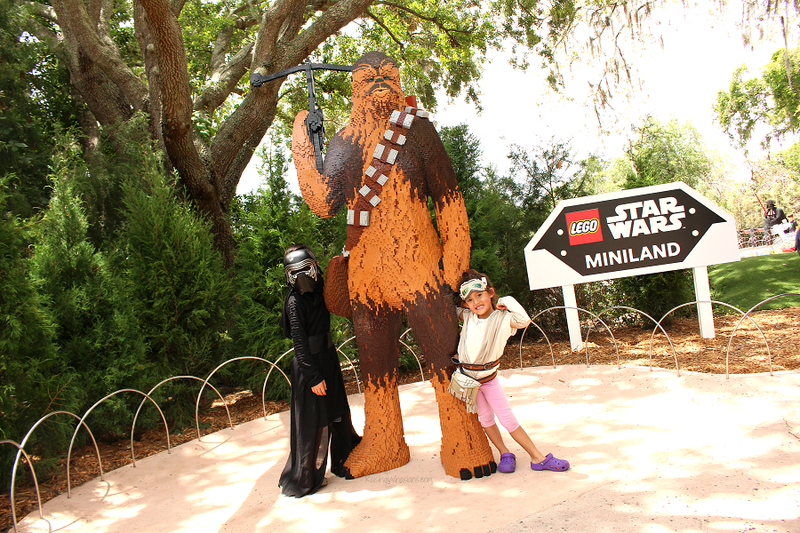 LEGOLAND Florida just unveiled the newest mini model inspired by the newest Star Wars movie, The Force Awakens. Thousands of LEGO bricks, lights, sounds and animation buttons are all included with this new Episode VII display that your family will love exploring. Be sure to check out the video above to get a full 360 view of this amazing new display. LEGO Rey across from the LEGO Studio Store AND at the Star Wars section of MINILAND U.S.A.
LEGO Chewbacca by the Star Wars entrance to MINILAND U.S.A.
My kids absolutely LOVE the LEGOLAND Florida character greetings. During the 2018 LEGO Star Wars Days, your family will have the opportunity to get those priceless photos with your favorite LEGO Star Wars characters. 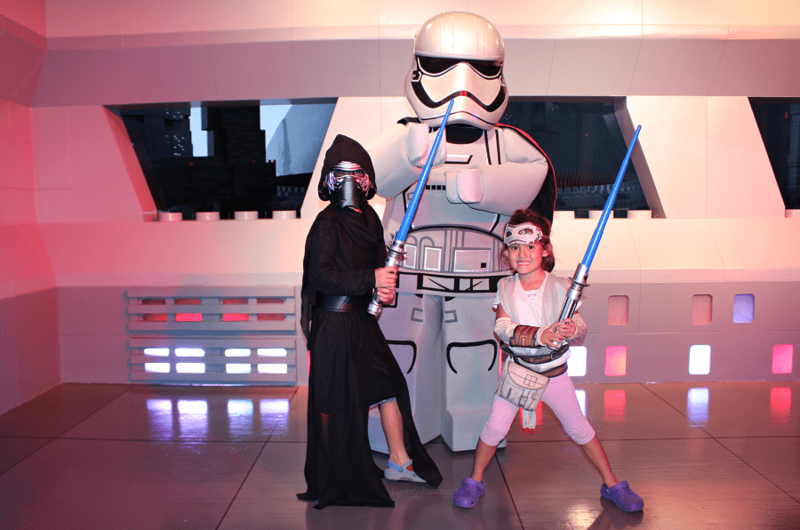 Capture those Star Wars memories as your kids meet LEGO Darth Vader and the all-new character, LEGO Captain Phasma inside of the building next to the Kid Power Towers. Find Your Force – Are you light side or dark side? Your choose LEGO Yoda model to reveal your lightsaber color. LEGO Lightsaber Scavenger Hunt – search for LEGO Lightsabers throughout the Imagination Zone for a chance to win a prize! 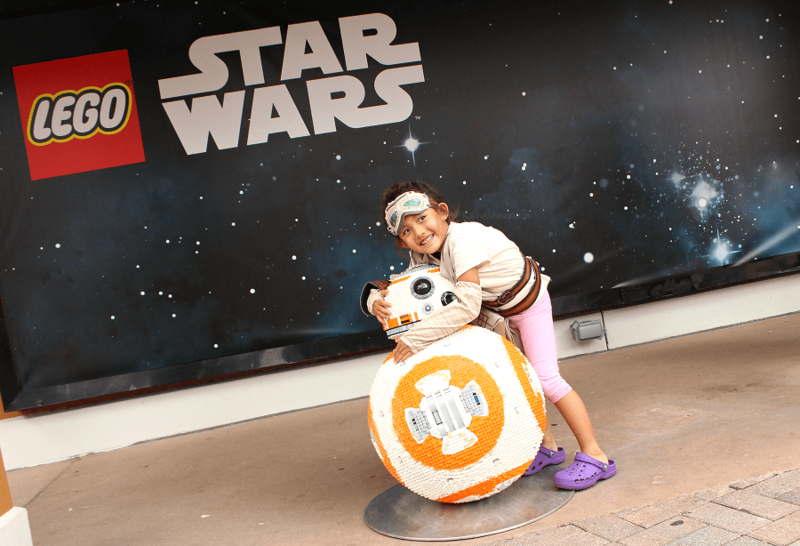 LEGO Star Wars Photo Fan Gallery – Check out this exclusive fan photography exhibit and enter to win a photo! 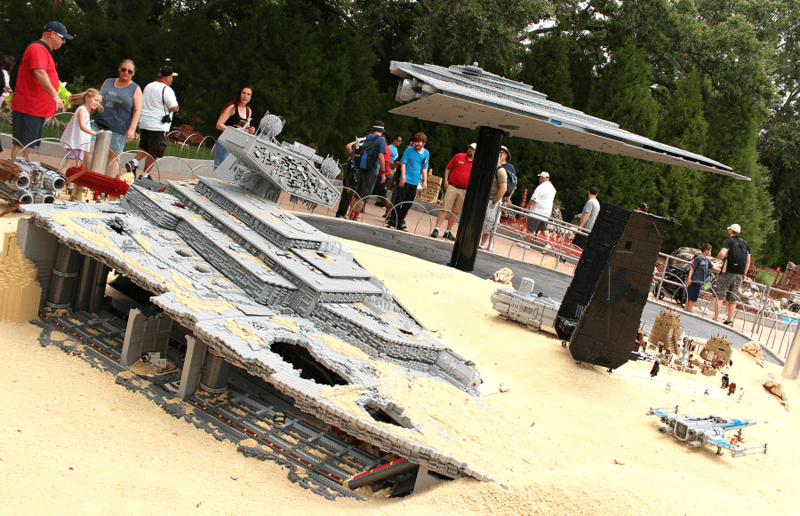 Galaxy Competition Build – Build your own Star Wars themed LEGO Model for a chance to win theme park tickets and LEGO sets! As if we needed another reason to dress up in a Star Wars costume! 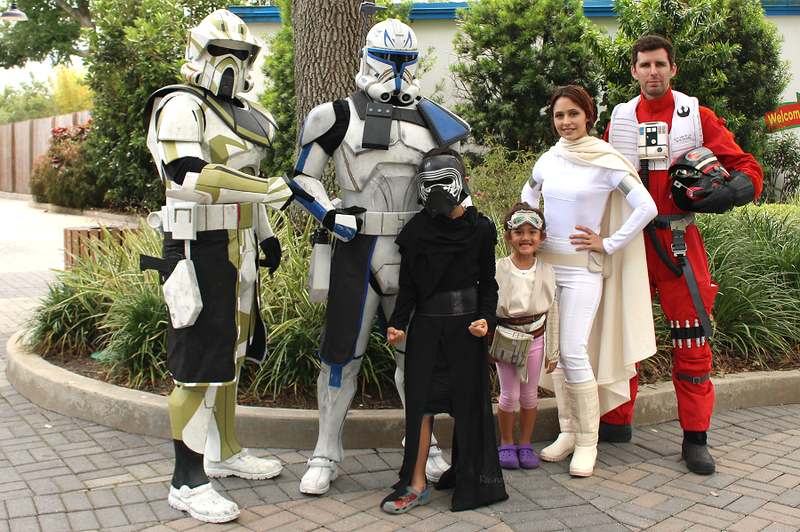 All family members are invited to come as their favorite Star Wars character. Be sure to stroll through MINILAND USA for a chance to win LEGO prizes (up to 200 winners per day). BONUS: your 2018 LEGO Star Wars Days photos will be extra amazing all dressed up! Hungry for some exclusive LEGO Star Wars Days food? 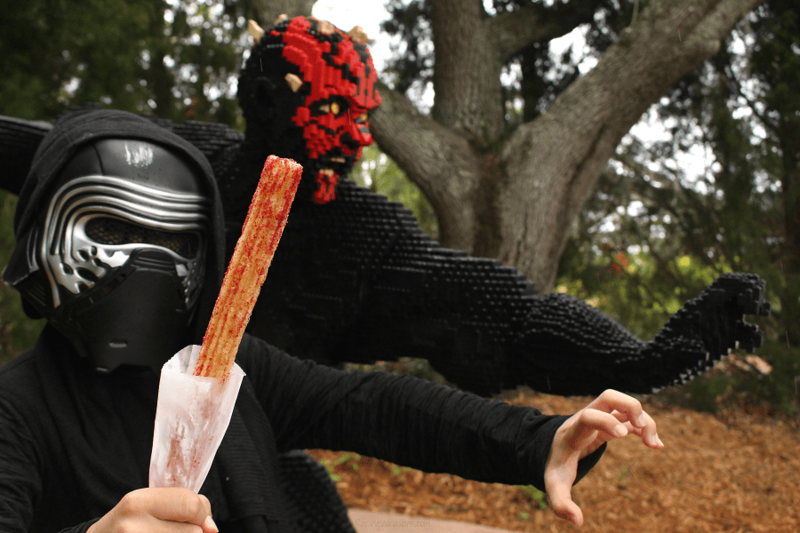 Grab these tasty themed eats, only available during the 2018 LEGO Star Wars Days weekends. 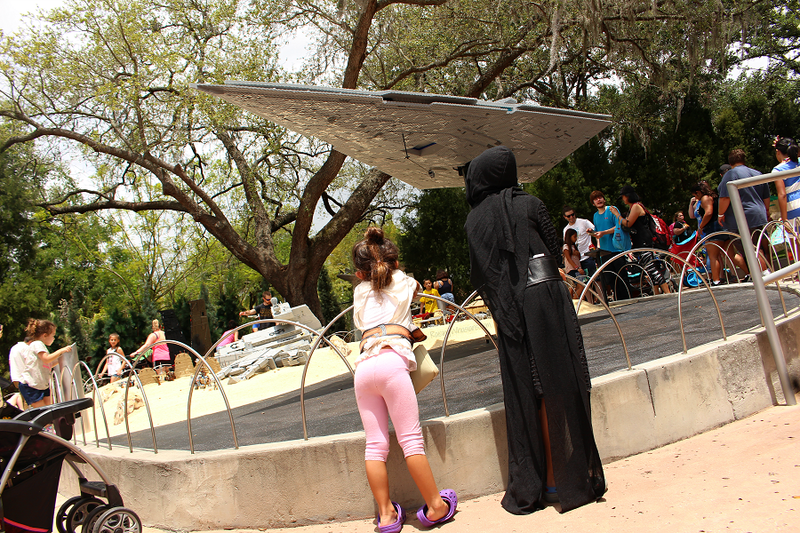 With 2018 LEGO Star Wars Days taking place in May, you bet that those Florida temperatures will just keep on rising! 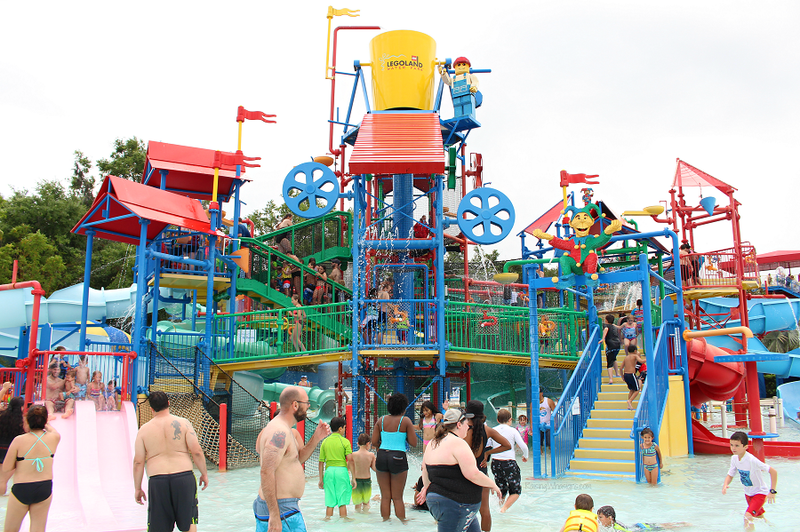 Be sure to bring your swimsuit to cool-off after a day of LEGO Star Wars fun at the LEGOLAND Florida Water Park. 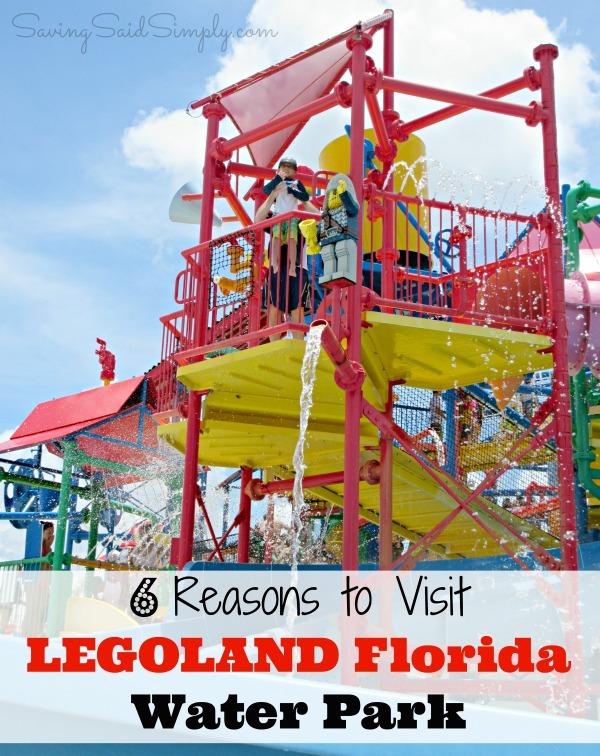 Conveniently located right next to LEGOLAND Florida, it’s easy to make a lightspeed jump over to this great water play area. 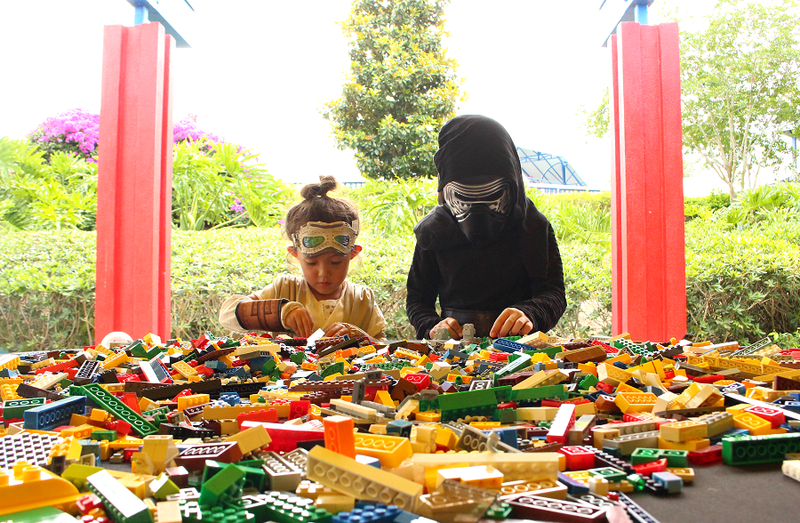 So whether you’re a huge Star Wars fan, LEGO fan or BOTH, there’s so much to do for the whole family during the 2018 LEGO Star Wars Days at LEGOLAND Florida. Want to extend your stay? Your family will love the theming at the LEGOLAND Beach Retreat or the LEGOLAND Hotel. But hurry – the exclusive LEGO Star Wars fun won’t be here long. Grab your tickets for the 2018 LEGO Star Wars Days: May 5-6, 12-13, 19-20. 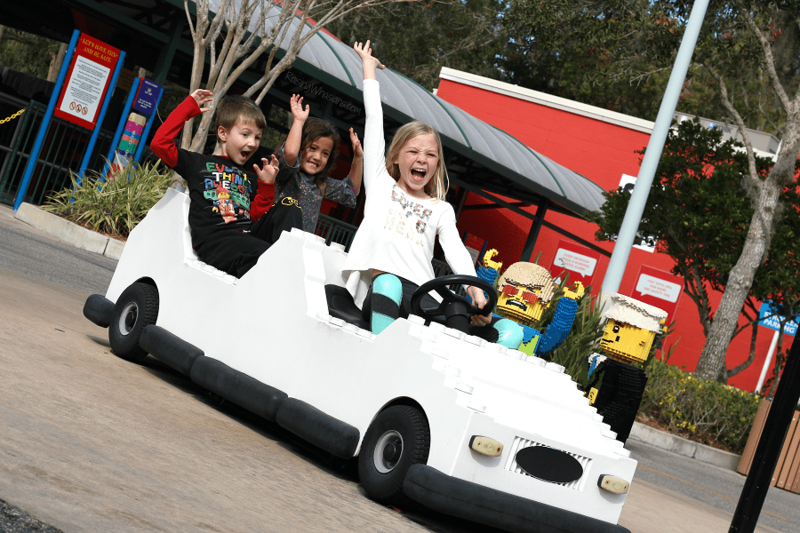 Be sure to follow LEGOLAND Florida via Facebook, Twitter, & Instagram for the latest updates – including new events, special offers, deals and more LEGO fun! Is your family ready to experience the 2018 LEGO Star Wars Days? I was invited to attend the 2018 LEGO Star Wars Days as media for this event. All opinions are my own. 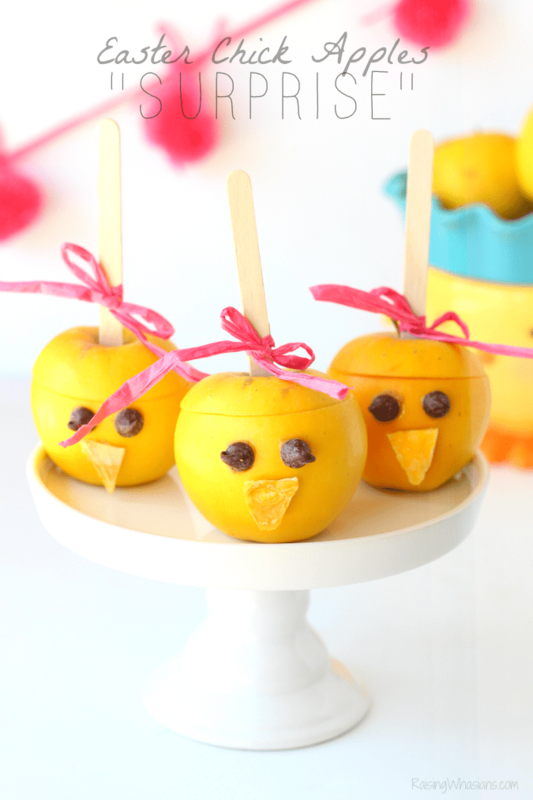 Be sure to follow Raising Whasians via Facebook, Twitter, Google, Instagram, Pinterest and YouTube for more family travel tips, delicious recipes, and kid crafts. I didn’t realize there was a Lego Park in Florida. We haven’t ever visited one but it sure looks like fun!